Scot took the photos and Maurine provided the text for this article. 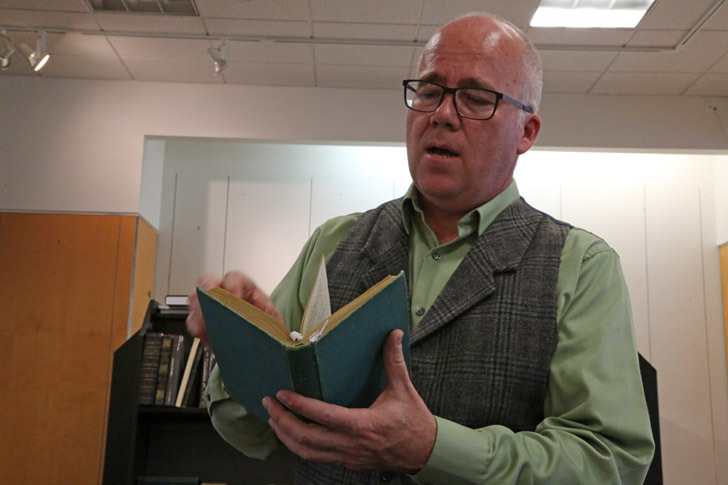 Reid Moon is going to become a regular columnist on Meridian Magazine. 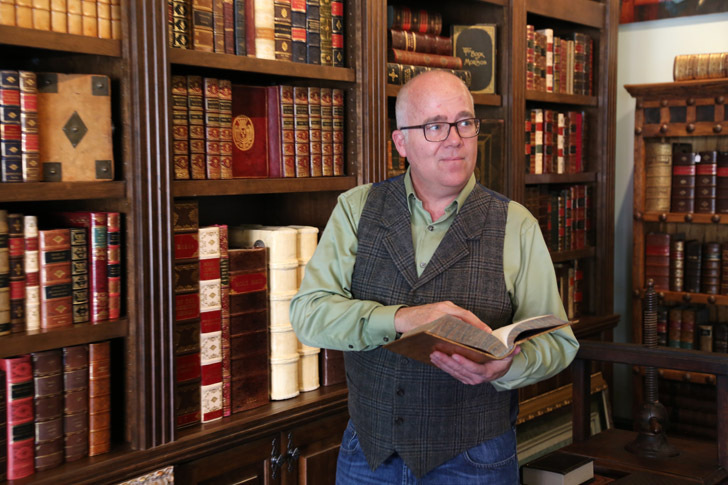 Reid Moon is unabashedly an LDS treasure hunter. 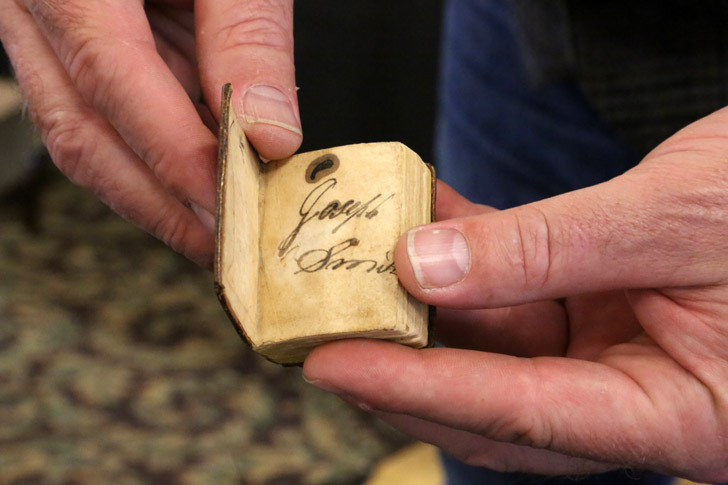 It is not gold that intrigues him, but the richer trove of LDS artifacts and rare books—things like Joseph Smith’s own copy of the Book of Mormon or Wilford Woodruff’s travel diary. You don’t usually just happen upon these things in an old bookstore, where volumes crowd the shelves and spill over into the floor. He has to follow trails of clues, be quick to see a treasure where others don’t, and know exactly what he’s found when he stumbles upon it. People have handed him what they thought were first edition copies of the Book of Mormon, and he can shake his head one way or the other immediately. He knows first editions well. He knows by tell-tale signs what is a treasure and what’s not. He’s knows how to follow clues like Sherlock Holmes and move fast when he needs t0. He holds up what looks like a rather plain Bible, dated 1947. That doesn’t sound like something special. 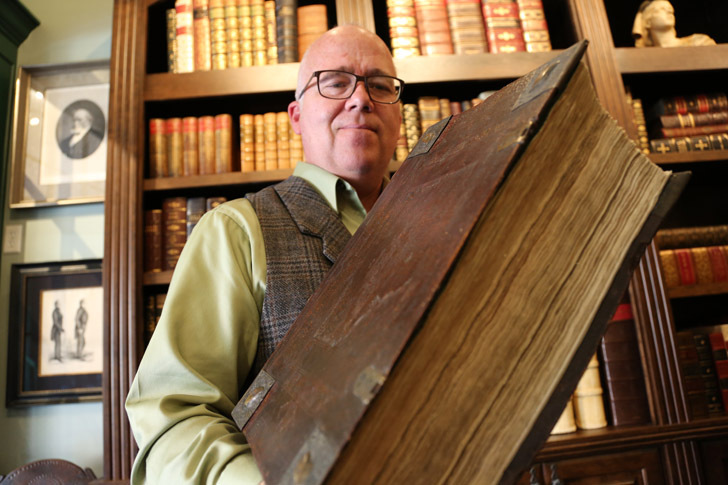 He got a lead on this Bible in Belgium, and when he got a call in Texas that it was available in Kansas, he had his family in the car in ten minutes to take a road trip to buy it. The Bible belonged to J.R.R. Tolkien, author of The Lord of the Rings, and had his own notes in it extensively. “If you don’t move fast, these things like this can disappear for a generation or more,” he said. His passion is not just collecting these rare finds, but sharing them and telling their stories, so they don’t remain public and remembered. See some of his rare finds here. 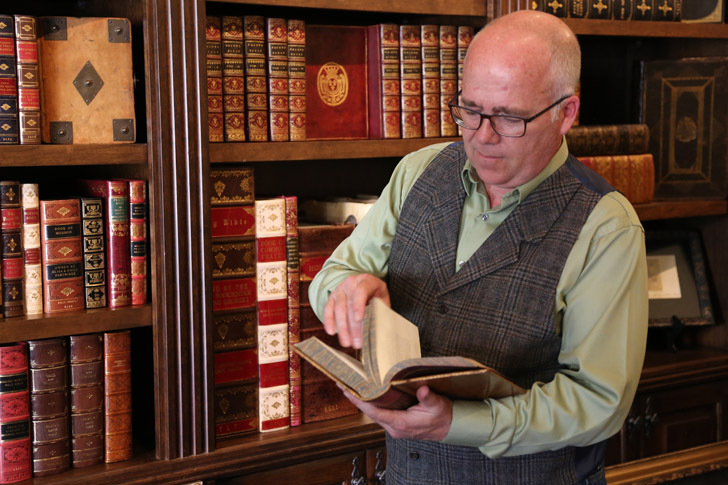 Reid Moon has collected over 30 Bibles from the 16th and 17th centuries and has a collection of over 100 Bibles. These treasures are usually stored in multiple locations in fire-proof vaults but will be on display this weekend. This is a first edition of Les Miserables in five volumes, written in French. The book was first published in Belgium, not France. 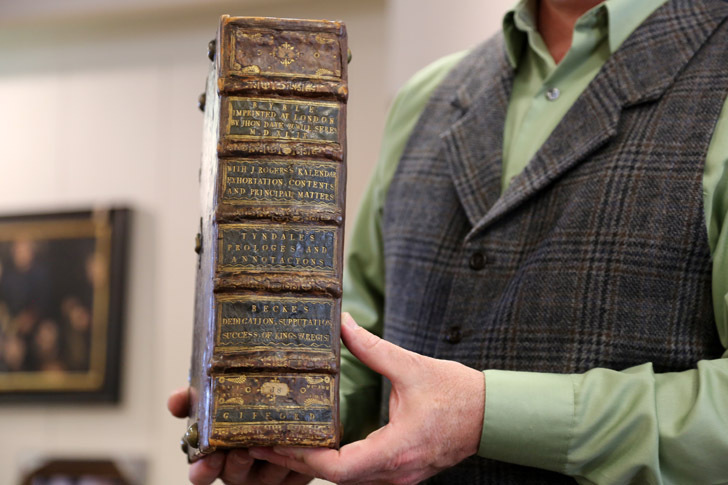 These early Tyndale Bibles are protected in decorative clamshells as you see here. The actual books are inside these clam shells where they are kept for protection. 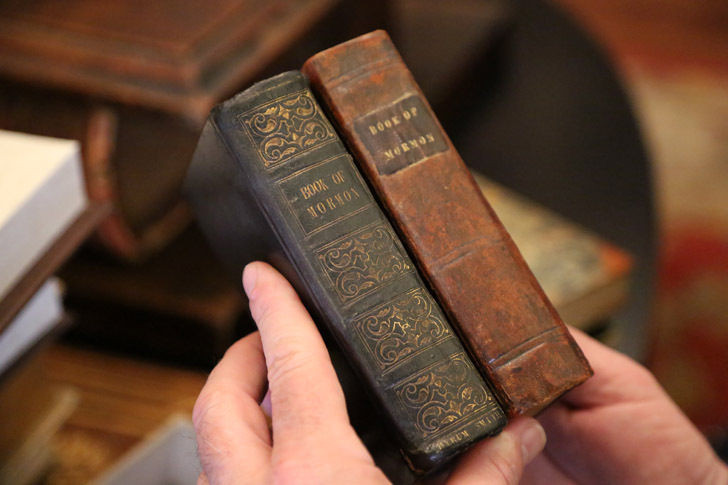 Here side by side are copies of the Book of Mormon owned by Hyrum Smith (left) and Joseph Smith (right). 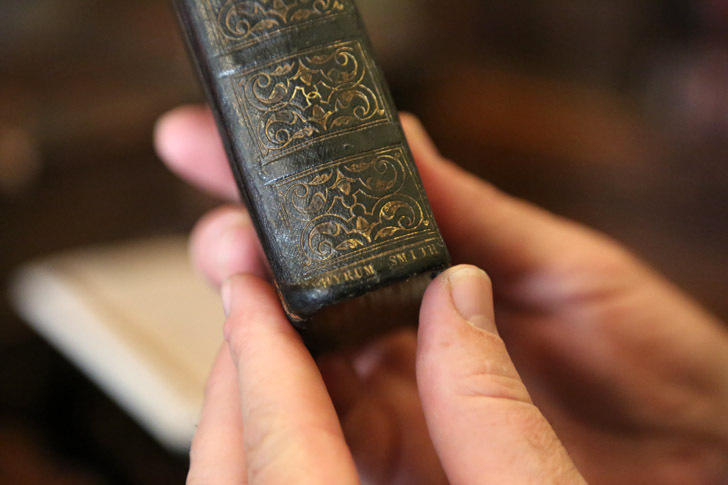 It may be this Book of Mormon Joseph Smith had in his pocket when he delivered the King Follett discourse. 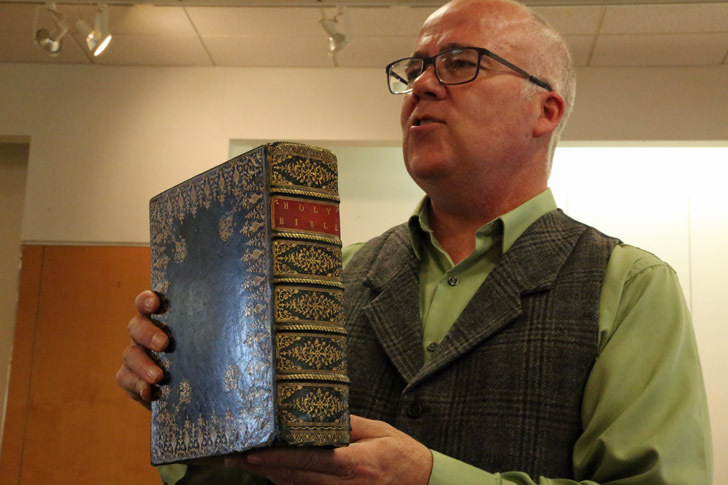 About a year ago, a family called Reid and wanted him to look at an 1841 edition of the Book of Mormon published in Liverpool that they believed had belonged to their forebear John Smith. 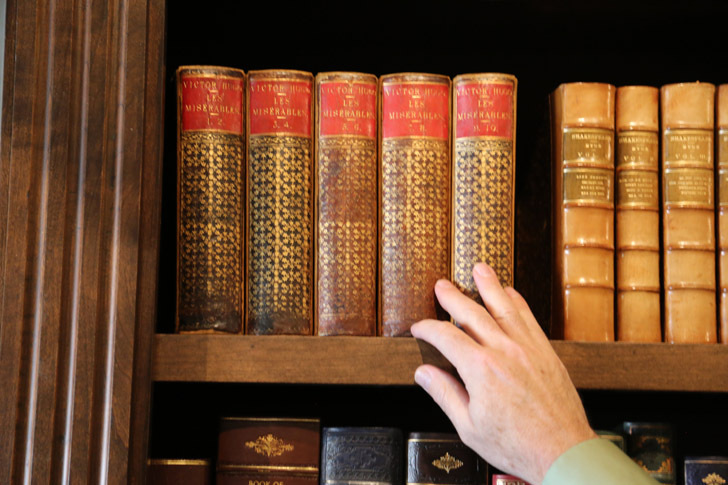 He asked, “Are you sure it isn’t Hyrum’s book?” When the bottom of the spine was cleaned, it was clear that it was Hyrum’s book. A remarkable surprise. 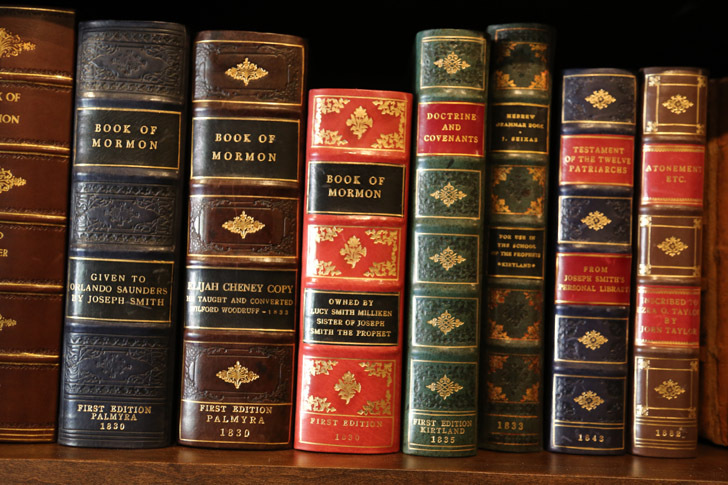 This is just a sample of the copies of the Book of Mormon and Doctrine and Covenants owned by Reid. 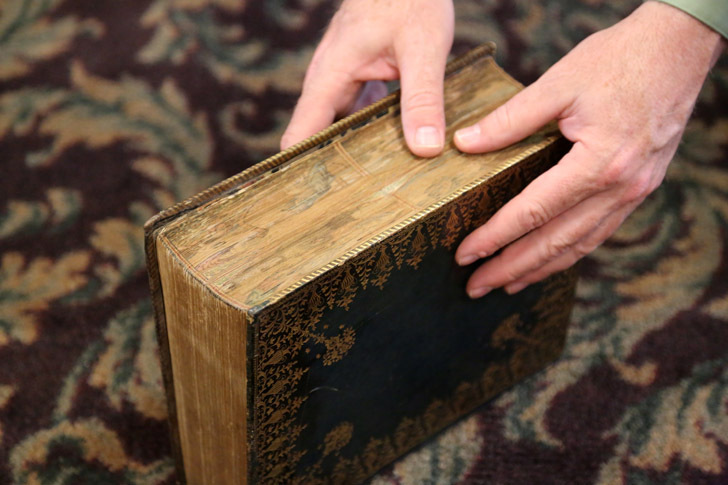 This hefty 1611 first edition, first printing of the King James Bible weighs in at 40 pounds. 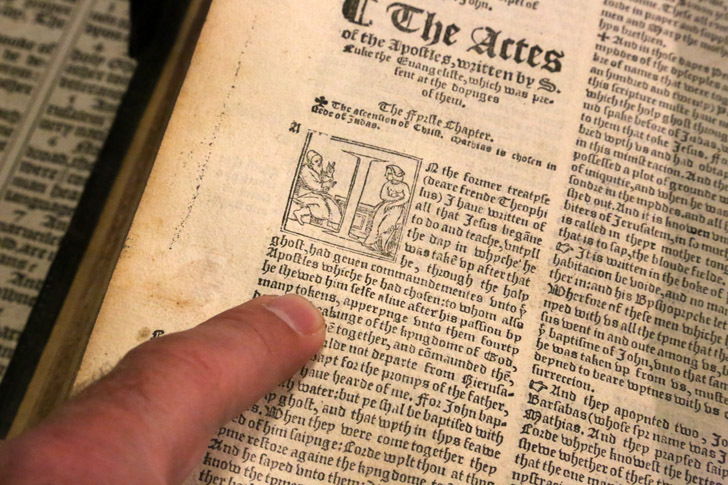 It is clear it is a first printing, because of a mistake in Ruth 3:15 where it reads “he went into the city” instead of “she went into the city.” The printers caught the mistake part way through the run and corrected the error. 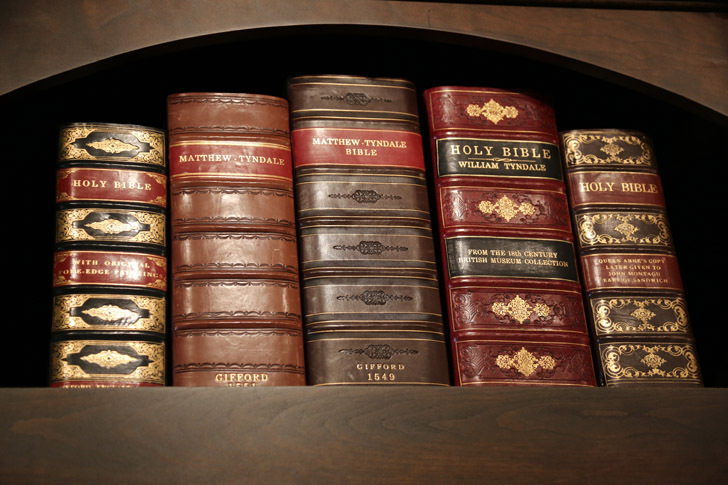 These so-called “He Bibles” are very rare. 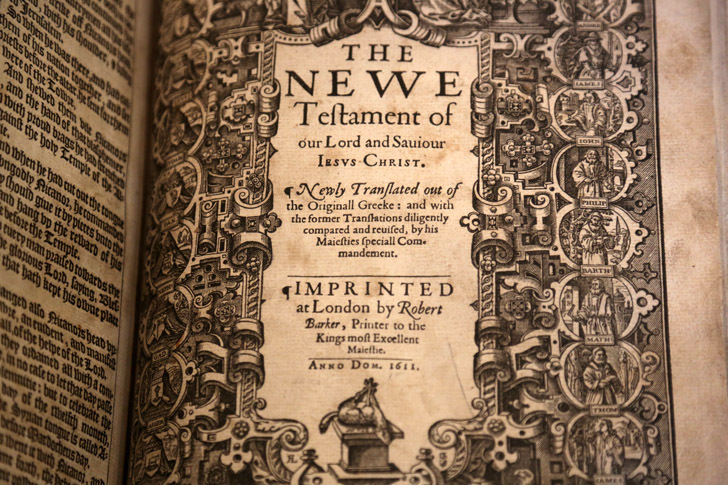 The title page of the original King James Bible from 1611. 2,000 were printed and only 500 survived. Most of them are owned by institutions, not private collectors. The beautifully-illustrated first page of the gospel of John in the King James Bible. 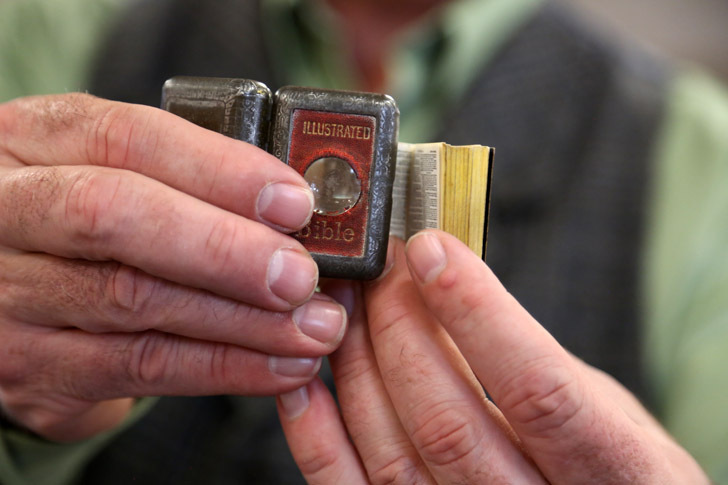 This miniature book is the smallest complete Bible, so small, in fact, that it comes with its own magnifying glass. The tiny printing was etched on steel and pressed on pages. These were popular from about 1780 to 1890 and we do not have the technology to do this today. 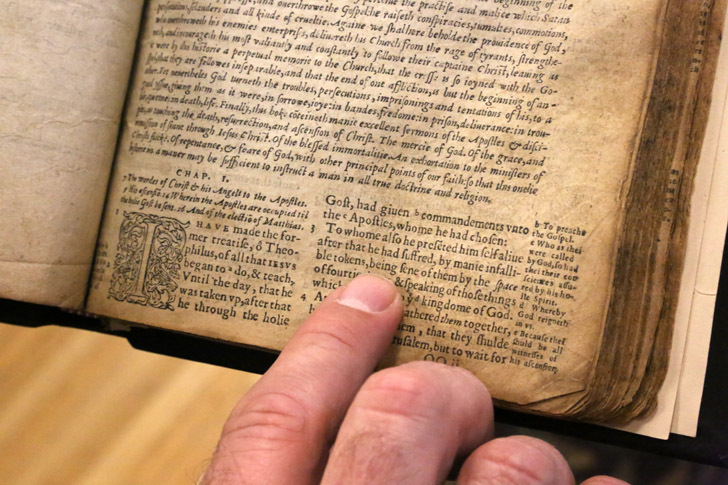 A rare Tyndale Bible. In this scripture, there are no verses and surprisingly no English word for atonement. 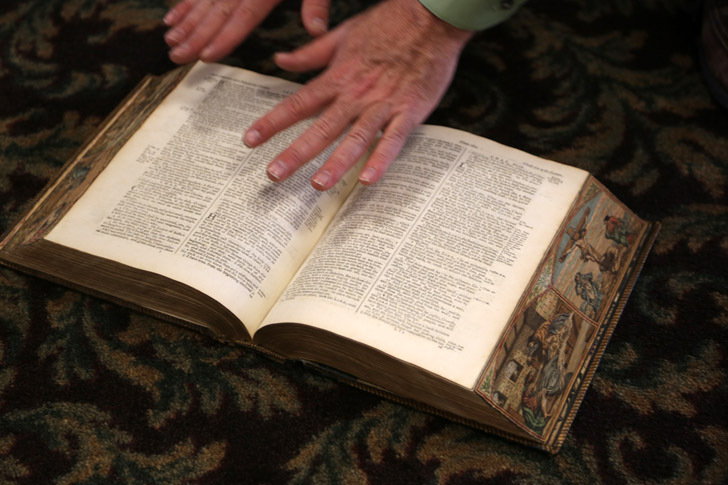 Tyndale coined the term at-one-ment which was then picked up by Shakespeare and used. 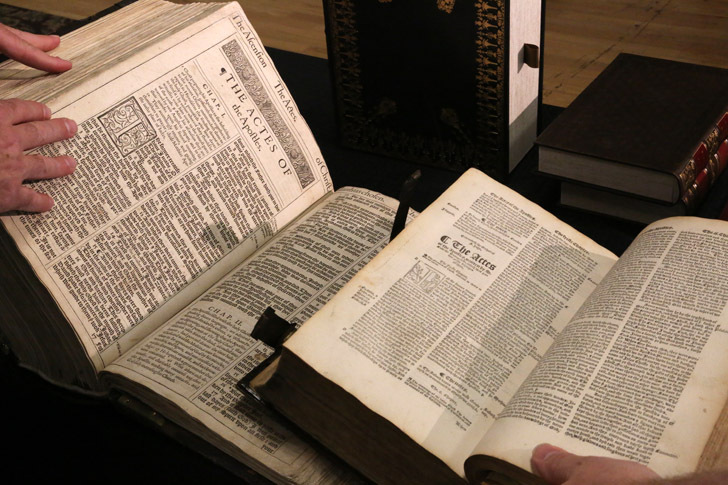 Comparing the verses from Acts in the KJV and the Tyndale Bible side by side. 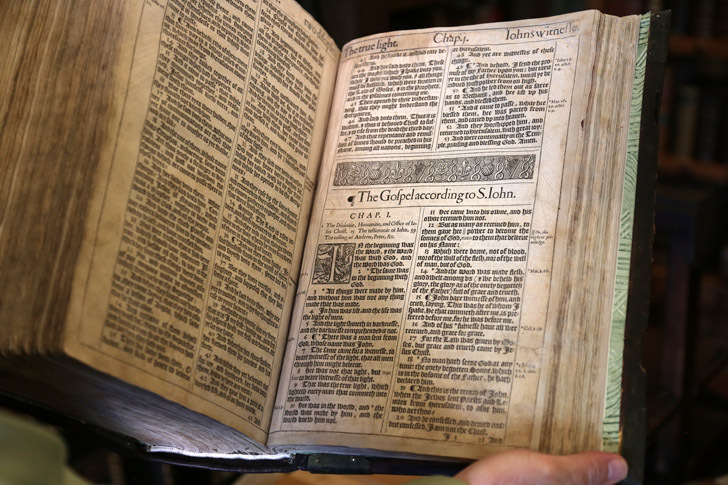 Here is a close up on the Tyndale Bible, highlighting his translation that the Lord showed himself after his resurrection by tokens. 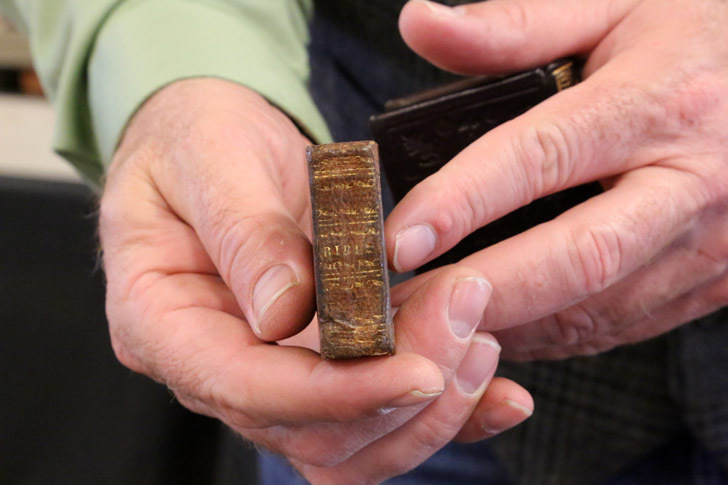 This Bible was printed six years before the Declaration of Independence in 1770. 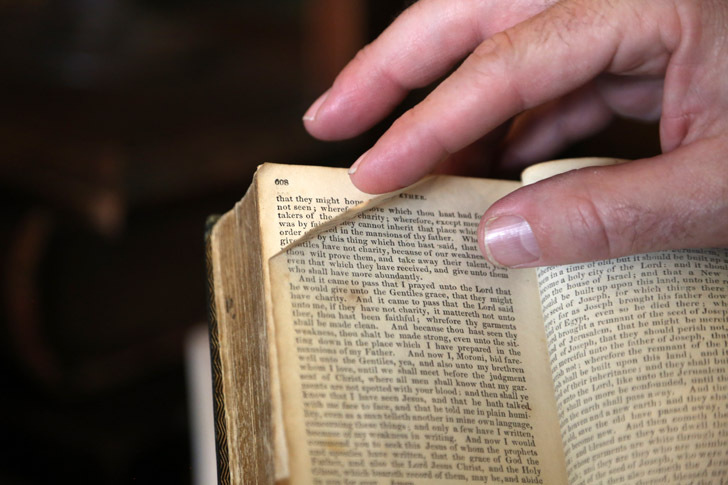 The edge of the pages look plain and undecorated when the Bible is closed. 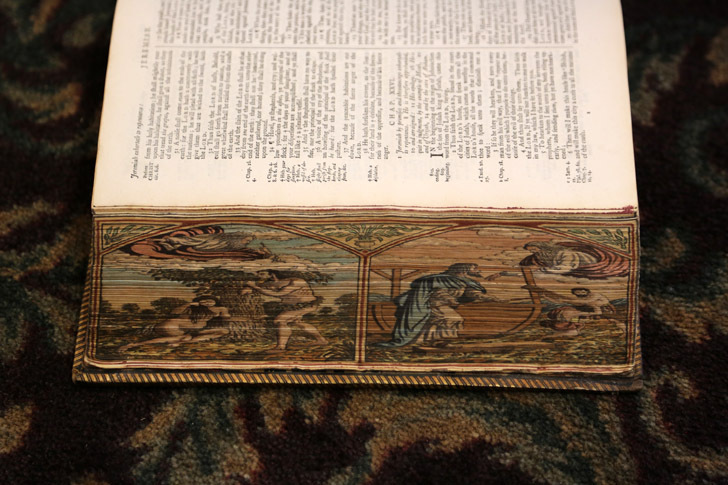 When the Bible is opened, however, colorful paintings are exposed on the fore edge. The paintings include scenes depicting Adam and Eve, Noah and the flood, the birth of Christ and his crucifixion. 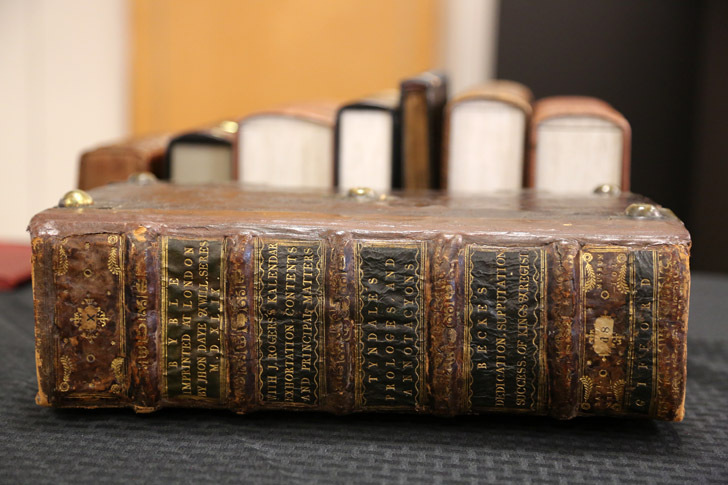 This looks like a rather ordinary Bible, but it actually belonged to J.R.R. Tolkien. It has Tolkien’s notes in the margins. 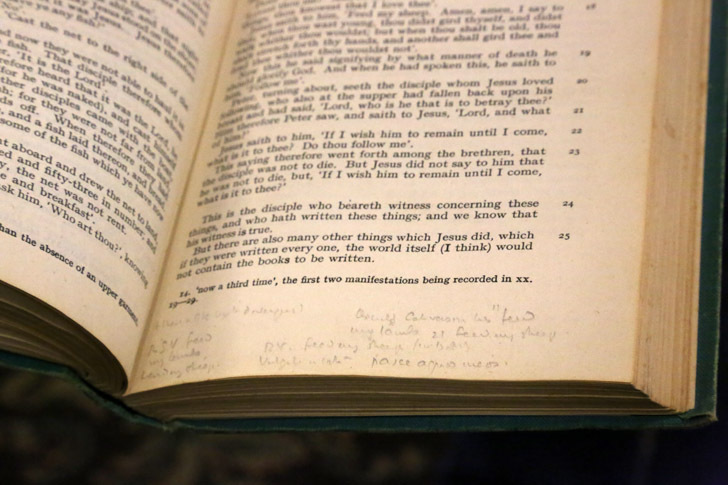 Tolkien’s signature appears in the front of the Bible. 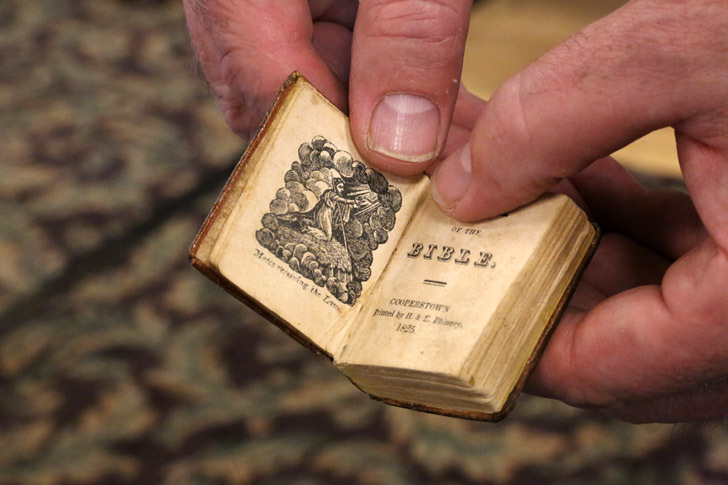 Joseph Smith had what was called a thumb Bible, called that because it was no bigger than your thumb. Even though Joseph’s thumb Bible was tiny, it still had miniature illustrations. 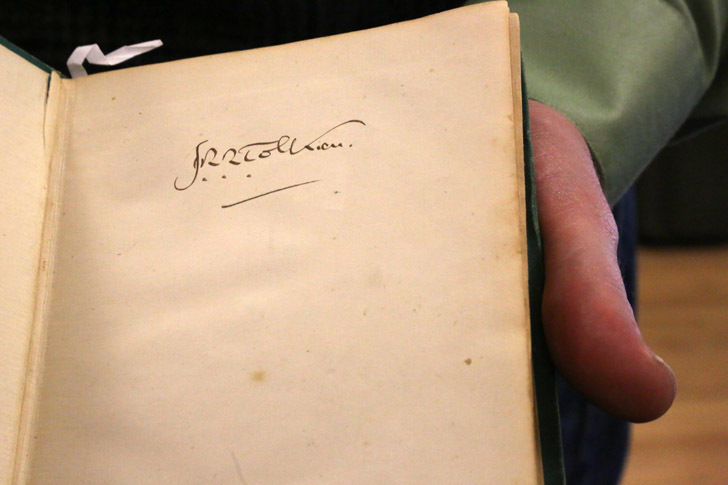 Joseph’s signature appears in the front of his thumb Bible. Where is the exhibit? I would love to see them.